Rare paraiba tourmaline has captivated gemstone lovers from around the world and commanded a higher price by weight than diamonds. The tale of this gemstone’s discovery only enhances its mystique. In the early 1980s the Mina da Batalha, a dilapidated old pegmatite mine in the Brazilian state of Paraíba, held no special promise to anyone but Heitor Dimas Barbosa. Though lacking any evidence, the prospector Barbosa felt certain that the site would hold a treasure unlike anything that had been discovered before. In 1981, Barbosa began the stubborn search inspired by his vision. Ignoring dubious contemporaries, Barbosa continued his dig for years with nothing to show for. Then about five and a half years after starting excavations, Barbosa’s crew glimpsed signs of a tourmaline find and the quest seemed justified. What no one knew then was that in another four years, this sight would yield something truly extraordinary and “completely different,” just as Barbosa had predicted. It became known as Paraíba Tourmaline. Tourmaline is the name given boron silicate crystals that may bear a variety of elements; Barbosa’s Paraíba is a cupriferous (iron-bearing) variety. Beyond being colorful, a Paraíba Tourmaline will appear to glow with a neon quality, even before it’s been cut and polished. This seemingly electric luminosity is an interaction of manganese and copper. For years Paraíba, Brazil was thought to be the only source for this distinctive stone, but in 2001 examples of a similar material began to surface in Nigeria and Mozambique. Scientists postulate that in a time before the continents drifted apart, the African and South American sites were in fact adjacent. The main separating characteristic is that Brazilian examples tend to be more intense in color. These days, “paraiba tourmaline” may refer to a glowing blue-green tourmaline from either continent while the title “Paraíba Tourmaline,” written as a proper noun with accent, denotes a stone which originates from Paraíba, Brazil. 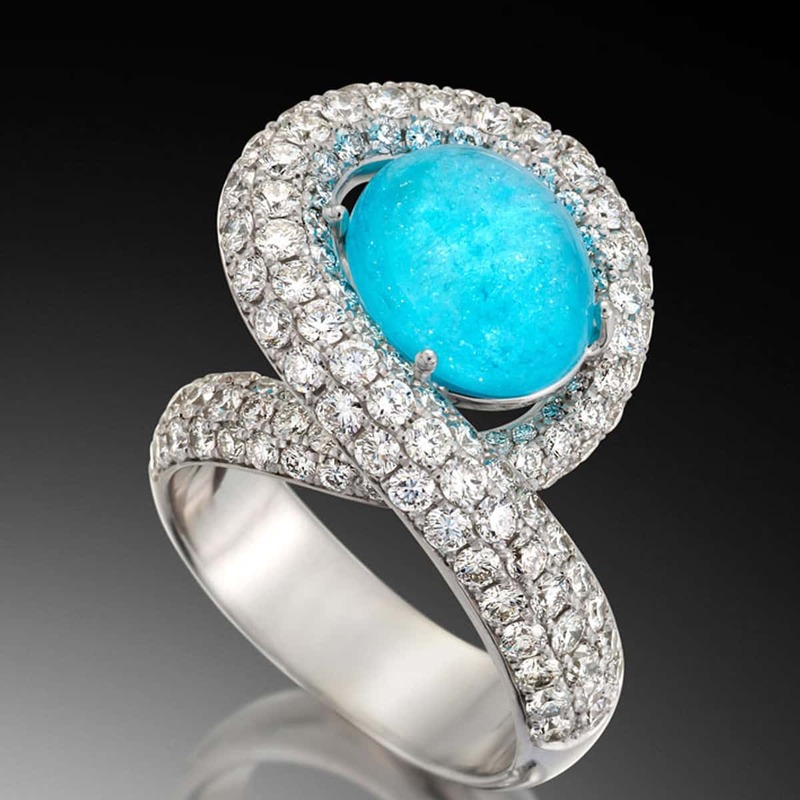 For its beauty and rarity, paraiba tourmaline is one of the most valuable gemstones in the world. “Aria” ring, featured above, features a rare Paraíba tourmaline of magnificent quality. View this ring, visit Aria’s product page, and discover other one-of-a-kind creations in Adam’s Couture section.